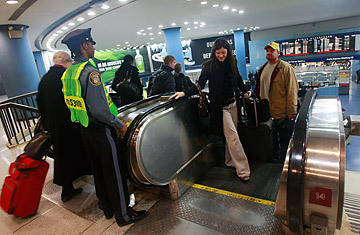 A guard keeps watch inside Penn Station on November 26, 2008 in New York City. Information provided by alleged Al-Quaeda member Bryan Neal Vinas led to the heightened security. Bryant Neal Vinas, a 26-year-old from Long Island, N.Y., has been charged with attacking a U.S. military base and providing information to the Al-Qaeda terror network. Although Vinas pled guilty to the charges in January, court documents remained classified because their publication could have compromised other ongoing investigations. They were unsealed on July 22, providing insight into one of the few Americans known to have joined or trained with Al-Qaeda.  A onetime Boy Scout who grew up in Medford, Long Island, Vinas was raised Catholic and is said to have liked football, baseball and video games.  Vinas' Peruvian-born father and Argentinean-born mother divorced when he was a teenager. Instead of going to college, Vinas joined the U.S. army at age 18.  He started attending Islamic services three or four years ago and eventually converted. He joined the the Islamic Association of Long Island, a mosque where most attendees are from Pakistan. While there, he went by the name Ibrahim.  Vinas became a licensed truck driver but quit his job and left home in 2007, saying he wanted to study Islam and Arabic. His parents had no idea where he went.  His confiscated computer revealed that prior to leaving home, Vinas had visited jihadist websites.  Because the young American had no previous criminal record and no connection with any other terrorist groups, he was able to travel freely through foreign countries.  Traveled to Pakistan and Afghanistan in late 2007 or early 2008, where he went by a number of names, including Ben Yameen al-Kanadee and Bashir al-Amriki (Bashir the American).  After a truck bomb killed more than 50 people at the Islamabad Marriott hotel in September 2008, the FBI interviewed the Vinas family about their son. According to Vinas' father, they indicated that it was just routine.  Vinas was in Peshwar, Pakistan in November 2008, supposedly to buy supplies and use the Internet, when he was arrested by Pakistani authorities. Authorities have not revealed how they located him.  He has been linked to a Belgian-French terror cell and also to Moez Garsallaoui, a Tunisian Islamist militant whom he may have met while in Pakistan.  Vinas was charged with conspiracy to murder U.S. citizens, providing information to a terrorist organization, and receiving "military-type training" from a Al-Qaeda. He originally pled not guilty but switched on Jan 28 and pled guilty to all charges.  According to court documents, he admitted to firing rockets on a U.S. military base in Afghanistan in September 2008.  Vinas informed U.S. officials of an Al Qaeda plot to blow up a Long Island Rail Road commuter train in New York's Penn Station, saying that he had provided them with details of the New York transit system. This revelation lead authorities to issue a Nov. 25 2008 terror alert.  He is expected to be a key witness in the cases of other Al Qaeda members, including that of Malika El Aroud, a Morrocan-born Belgian woman accused of recruiting Al Qaeda members over the Internet.  Vinas is currently in the custody of the U.S. Marshals Service in an undisclosed location somewhere in New York. "[He was] very quiet, very smiley." "If he is Al-Qaeda, he should be arrested. He's a terrorist." "I don't think he would be in trouble with, like, terrorists. I think he was in Pakistan because he was excited about the religion." "There was never an imminent threat to the system." "I love him as a son, but I don't know nothing about him." Read "What a Top Terror Tracker Learned About Osama bin Laden"